The chicken spit accessory is one of the most visually pleasing products available from the Platinum range. It brings variety to the spit roast accessory. 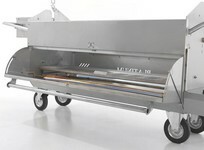 The spit roast accessory on its own only has the capacity to cook full bodied pigs and lambs, however by using the chicken spit with spit pole and motor it opens up a world of capabilities. Using the chicken spit allows the user to cook to 36 chickens, turkeys, strips of beef or legs of pork all in rotisserie style. 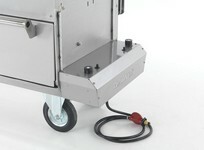 The chicken spit accessory utilises the rotating aspect of the spit roast kit, incorporating that traditional and unique method of cooking that people love with the versatility and capability of the hog roast kit that makes cooking various combinations of food for large numbers easy. The chicken spit must be used with the motor, pole and carving tray that comes with the spit roast kit. 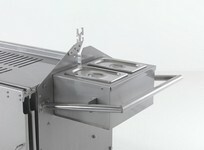 The chicken spit attaches to the motor via the spit pole and rotates in the upper cooking area of the machine base. The products can be viewed throughout the cooking process through the toughened class viewing panels and the temperature of the cooking area is regulated by two thermostatically controlled full length burners in the base of the machine. Once cooked the entire chicken spit can be raised up into the service position. This displays the meat as a fantastic centrepiece for all guests and customer to marvel at. Carving direct from the machine using the chicken spit couldn’t be easier, each one of the five spit arms can be detached independently from the main assembly and meat can then be added to the carving tray to carve from. 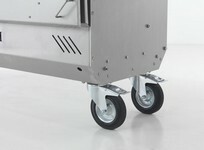 This allows the user to maintain the aesthetic qualities of the product whilst working efficiently to serve customers. Furthermore the carving tray can be used as a hot plate to keep the products warm during the service as it is powered from the burners below. The two gastronomes at the end of the machine can be used to add any necessary accompaniments to the meal. To learn more about the chicken spit accessory or any of the platinum products then give us a call in the office one of our team will be more than happy to answer any questions on our range. We also invite any one of customers to come to our showroom to view our entire range. You can also get in touch using email or the contact us form and we will gladly send over our brochure, price list and answer any questions you may have.